As the world waits for the launch of the much-anticipated 2014 Alfa Romeo 4C, a new exclusive Launch Edition is being unveiled in Geneva that will be offered in a very limited number. This first model will be very exclusive and only 1000 examples will be produced for sale around the globe. And the U.S. doesn’t get left out and will see 500 Launch Editions along with 400 units in Europe, Africa and the Middle East and 100 in the rest of the world. The limited version is being dedicated to the many fans who have waited for this moment for so long. Finally, Maserati will begin building the new 2014 Alfa Romeo 4C at their Maserati factory in Modena Italy plant along side their flagship Gran Turismo coupe and convertible models. The compact Alfa Romeo 2-seater will go on sale in 2013 and will mark the return of the Italian brand in the United States. The special new limited version of the new supercar offers unique exterior carbon fiber trim and a 'White Carrara' body color. The price of the new 'Launch Edition' may be more than expected here in the U.S., and will sell in Europe and other global markets for 60,000 euros ($78,000 U.S.) Orders for the new limited edition 'Launch Edition' were opened up for buyers at the debut of the exclusive model in Geneva. Buyers of the Launch Edition in Europe will get to participate in an exclusive event in Italy that features the privilege of having the advanced guidance of professional drivers instruct the new owners. The professional driving instructors will instruct owners how to get the most of the potential of the Alfa Romeo 4C safely. And the new owners will have plenty of power under the hood of the new 4C to learn to control. The two-seater will have a power / weight ratio of less than 4 kg / hp. With that type of horsepower and light weight, the 4C will be one quick sports car. Alfa Romeo says the new 4C will launch from 0-60 mph in just 4.5 seconds with a top speed of 155 mph. 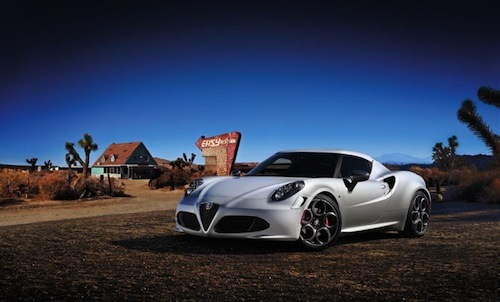 The 4C’s rear-wheel drive mid-engine design will weight less than 1870 pounds. It will be powered by a 1.7-liter, direct-injected turbocharged four-cylinder aluminum engine that will pump out 240 horsepower and 258 lb ft of torque. The engine will be mated to an Alfa TCT dual-clutch gearbox with shift-paddles on the steering wheel and new Alfa DNA selector with additional 'Race' mode. Alfa Romeo says the new 4C will support up to 1.1 g of side acceleration on corners and 1.25 g of braking force. The Brembo brakes feature four-piston aluminum calipers on the front axle. Inside, the new exclusive model will get leather sports seats and steering wheel with white stitching, special badging and will be numbered. The red livery Alfa Romeo 4C 'Launch Edition' has the red stitching on the lining of the steering wheel, handbrake, floor mats, door handles and sports seats. This marks the growth plan that the Italian brand has around the world. Fiat has big plans for growth of its brands in North American, and the U.S. will see 1,200 examples of the new 2014 Alfa Romeo 4C and 500 of the new Launch Edition.